Salmon fishing this week is reported to be HOT! 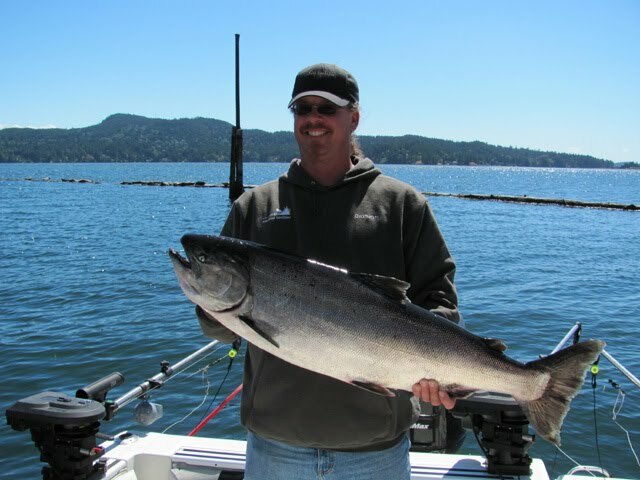 Dave from Ocean Dreams Fishing Charters reports a trip yesterday where they caught 16 spring salmon and sockeye in two hours. Neil from Salty Towers Oceanfront Resort has been out in the morning last few days, catching his limit before 9am -- yesterday one 20 pound spring and 7 sockeye. The day before two spring salmon over 30 pounds. Not bad! Gord from Foghorn Fishing Charters reports good fishing lately: "Finding a few good fish each trip -- see the pics of some happy clients. Sockeye fishing has been good since the opening. No special colours or depth just working everything, big bait little bait, try all of it and it will happen. A hook in the water catches fish!" 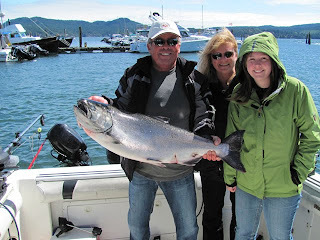 For sockeye, right out front of Secretary Island in 300 feet plus depth seems to be working, with gear 40-80 feet depths -- any flasher with a short leader (20") to a pink or red hootchie. In the morning has been best, before 10 am. For springs, not a lot of specifics to report on gear and locations. Possession Point has been good, as has Otter Point. Time to down tools and get out there and fish for them, while they are here!